When you pick up a Schecter Damien Platinum 6 FR-S guitar, you'll be amazed by all of the details and finishing touches that make this a truly value-packed instrument. The 3-piece maple neck is incredibly rigid, resisting warping while enhancing sustain and tone. What's more, these details aren't just cosmetic. The Damien Platinum 6 FR-S is built to take any abuse you can throw at it with a solid mahogany body and set-in neck. This guitar is ready for your next gig, no matter how crazy it gets. For liquid sustain and lava-hot leads, you just can't top the Damien Platinum 6 FR-S's combination of active pickups. Possibly the most popular pickup in metal history, the EMG 81, will let your solo cut through and stand out in any situation. And the Sustainiac neck completes the picture, giving you exactly what you'd expect - epic sustain for days. Schecter didn't give the Damien Platinum 6 FR-S just any old tremolo, they went for the real deal: a Floyd Rose Special. The Floyd Rose Special on the Damien Platinum 6 FR-S is an authentic Floyd Rose design, which gives you the same design as an original vintage Floyd Rose model, plus the advantage of lightweight zinc alloy components. You can dive-bomb, whammy, and flutter all night with this tremolo! You'll find Grover Rotomatic tuners onboard the Damien Platinum 6 FR-S, with an 18:1 gear ratio for ultra-precise tuning. Whether you're tuning standard or tuning down low, you'll find your pitch and hold it securely with these premium tuners. 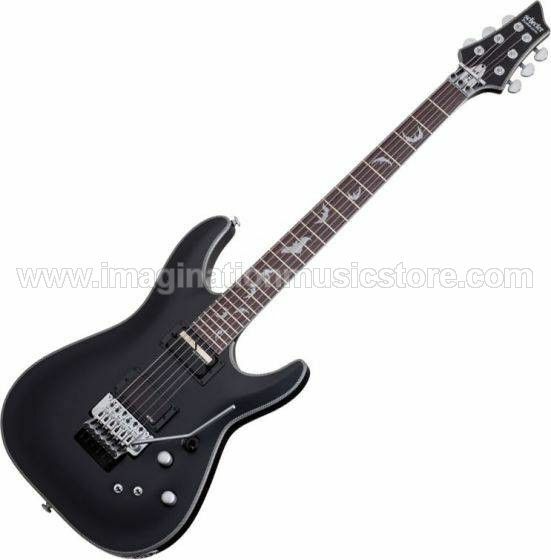 The Schecter Damien Platinum 6 FR-S is a workhorse made for rock and metal!